Full of character and real life, Madrid's busy markets are an integral part of local life. They provide a great place to find bargains or just browse around the wide variety of stalls and enjoy the exciting atmosphere and local market banter. Goods may include CDs, DVDs, clothes, antiques, plants, books, food, and much, much more. Madrid's bustling markets provide a fun way to shop, for both experienced and novice bargain hunters alike. Visiting the marketplaces is highly recommended for tourists in the day and also later at night, when they become some of Madrid's key social locations, being full of pubs and bars. The streets are turned into one of the largest flea markets in the world. Items sold include antiques, clothes and lots of useless bits and pieces. Worthy of a visit for the character of the market alone. On the site of a renovated fish market are stores and galleries with antiques, art, fashion, cafés and restaurants. Collectors gather to buy and sell stamps, banknotes and coins. Approximately 30 outdoors stalls for buying and selling new and second-hand books. A collection of authorities in craft in the district of Tetuán. 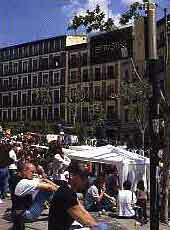 In this square, located near the Plaza Mayor, artists attempt to sell their paintings. 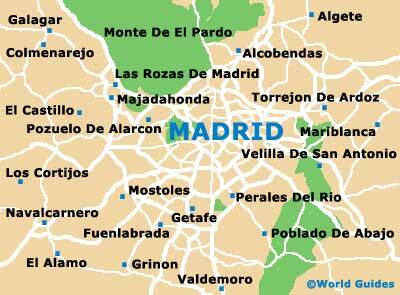 Every district in Madrid has a market selling an immense range of produce inexpensively.